"The Colorado Springs Art Business Trip!" 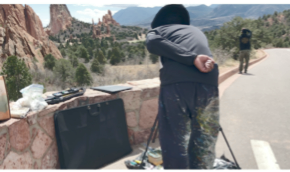 Me setting up my display at the Garden of the Gods Landmark Park. The Map of the National Landmark Park of the Garden of the Gods. 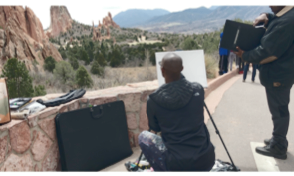 The Display setup of the Live painting art show at the Garden of the Gods on Wednesday, April 17th, 2019. The finished product of the live painting for the Garden of the Gods in Colorado Springs . After I finished the painting I donated/sold it to the Hostel I was staying at in Colorado Springs, Colorado. Furthermore; The Springs of Colorado was a pretty good relax and laid-back cites. Lots of hiking and open national parks in the city. There will be more art solo travel business projects in the near future. Can’t wait to do more and be more inspire of what I loved doing. Goodeye Visual Art' Is headed to the Springs of Colorado This Spring!" 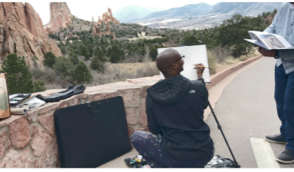 This will be the fifth installation in the USA enpleinair live painting series on the bucket list world travel for the art business project since the domestic Seattle Washington trip two years ago in the fall of October 2017. So if you're in or live in the Colorado Springs area around the date times? 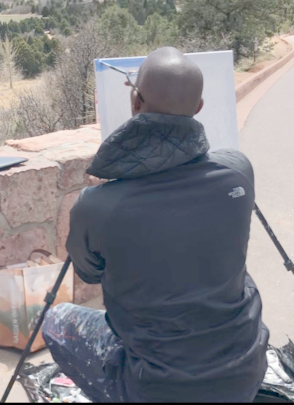 feel free to come and stop by to check out my live painting en plein air of the Garden of the Gods National Park project artwork. I was work on a Yellowstone National Park art project series from January 28th, 2019 to March 7th, 2019. I did six project paintings from photographs that I took last summer of 2018 on my one day trip out to Yellowstone in Wyoming. The photographs I took of Yellowstone was from the front entrance of the park side tourist attraction that’s main known for it’s popularly. See the pictures below of the six main spots I took photos of and painted on a canvas of Yellowstone National Park. This Yellowstone painting I did on a 16x20 canvas painting is the Morning Glory Pool. The spot is one of the main popular tourist attractions that is located in the super volcano park. This hotspot pool project took about at least fifteen hours for me to complete with acrylic oil paintings. This is a photograph painting I did of the Grand Prismatic Spring. This acrylic oil painting color of the hot spring took about 12 hours for me to complete. The painting project is on a 18x18 canvas square shape. This one is the main attraction spot that visitors see when they come to Yellowstone. The hot spring is a football field long and you can spot the whole super volcano hot spring on the top of the three mountains. That I painted in the background in the inspiration project. This project is a painting of the Grotto Geyser that is located in the Geyser’s super volcano area. This one took about eight hours for me to complete. The landscape painting is a 16x20 canvas with acrylic oil black and white colors. This attraction section area is located in the front entrance of the park. 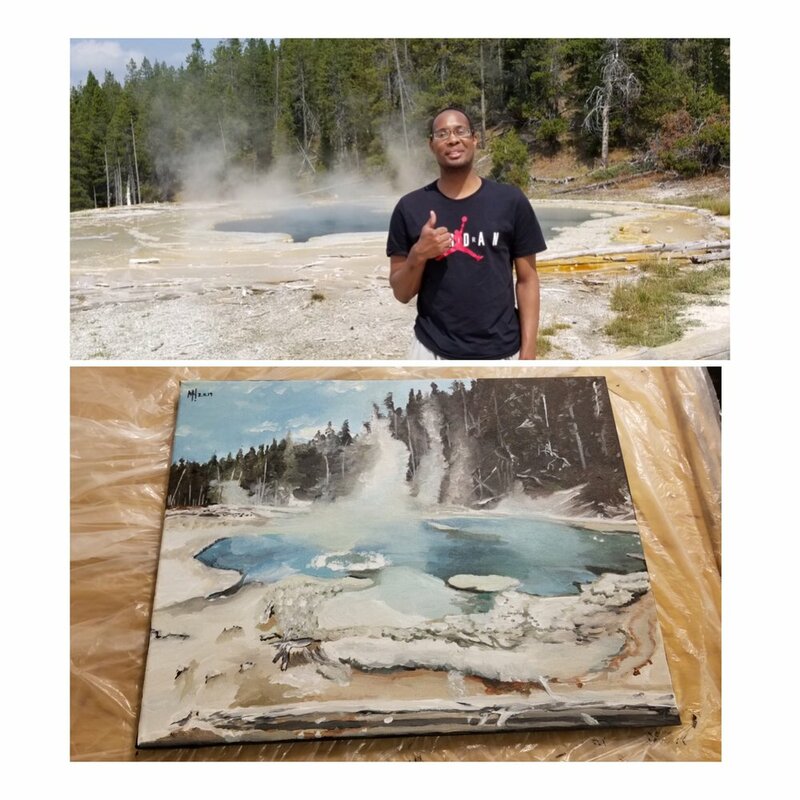 This painting that’s on a 16x20 canvas of the Solitary Geyser super volcano hot spring took about thirteen hours to complete the project. It’s also made out of acrylic oil painting and this location is up on the hike trail mountain inside the Yellowstone Park. 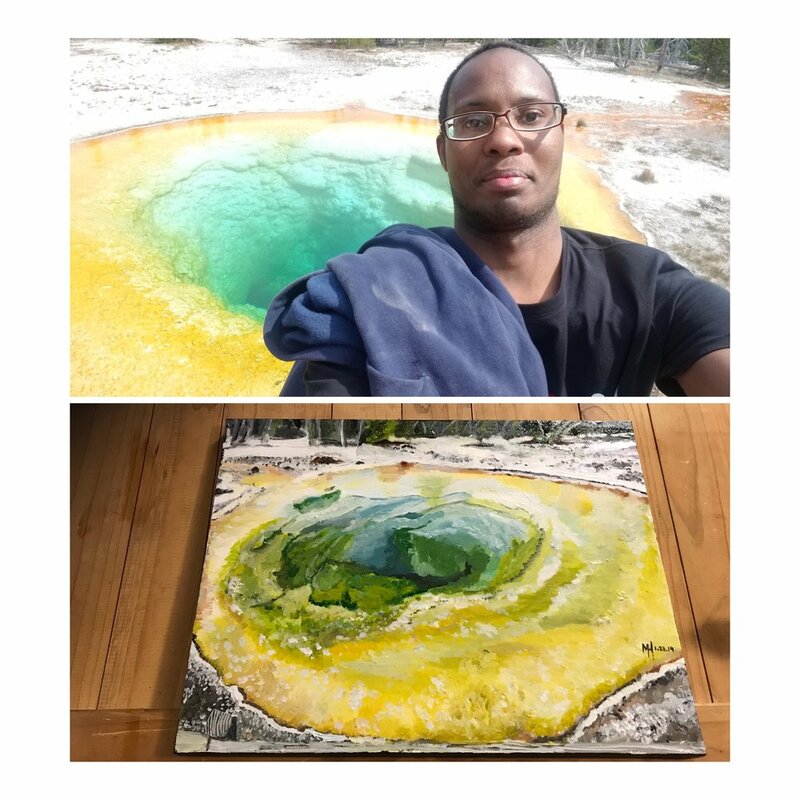 This painting is the Upper Geyser Basin that is located in the back deep side of the park close to the morning glory pool. The project took me about another eight hours to complete. The painting is made out of also acrylic oil colors. This is a picture I took of the camping zone mountain upper deck view at the Grand Teton National Park at Wyoming. This one is not located at the Yellowstone National Park, but 45 minutes away from the area. The project is a 16x20 canvas. It’s also made out of acrylic and oil paintings that took bout ten hours to complete the project. The nick name for this is called “PaintBrush” because of it’s beauty color nature. The inspiration project was really inspiring for me to do after I visited both National Parks of Yellowstone and Grand Tetons. I really enjoy making seven beautiful paintings in this series art project. More paintings will come from me in the near future of the Grand Tetons. I can’t wait to do more and keep creating good amazing content. Me setting up my display art project live Painting at the Mrs Macquaries Chair waterview in Sydney, NSW Australia. The finished painting project of the Sydney Opera Harbour Bridge I sold to the Hostel I was staying at in Sydney. The Sydney Harbour YHA Hostel share my Painting I donated to them on their social media and display it on there flatscreen TV. Me setting up my art display project at Bondi Iceberg pool in Bondi Beach, NSW Australia. 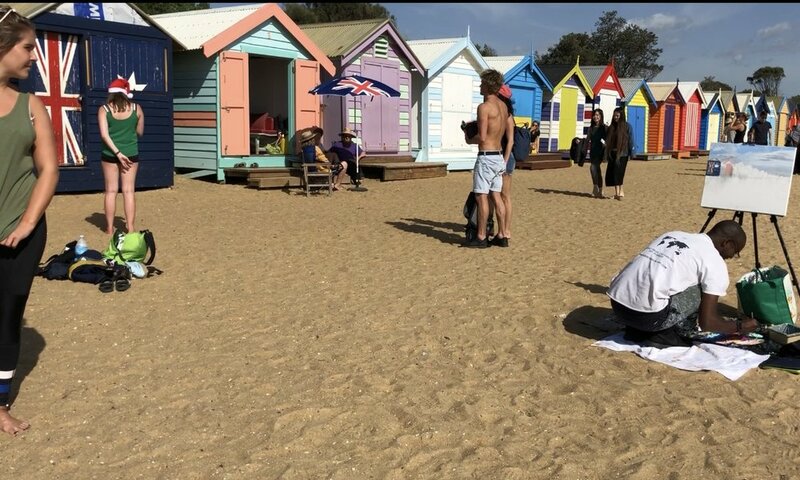 The person on the right I met at Bondi Beach that I Sold the painting too. Me setting up my display art project at Byron Bay Cape conversation view/Tallow Beach in Byron Bay, NSW. Me setting up my art display work at the Brighton Beach boxes in Brighton, VIC Melbourne Australia. Me and the finished project painting of the Brighton Beach boxes at Brighton, VIC Melbourne Australia. 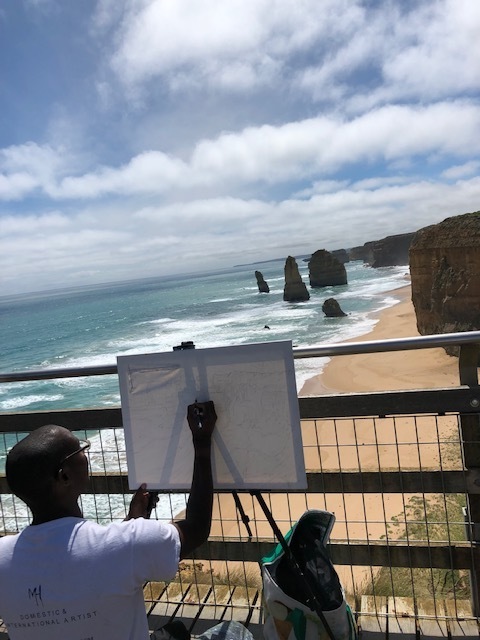 Me setting up my display art project painting at the famous iconic Twelve Apostles National Park in Princetown, VIC Australia. The finished product art painting project I did of the famous Twelve Apostles National Park view in Princetown, VIC Australia. My trip to Australia was only my second International trip abroad outside of the USA on my bucket list travels. This place really touched my soul in every single way with the landscapes, beaches the wonderful people, the food, and the popular place which I enjoy the most of my time in Australia was Byron Bay. Byron Bay have to be my favorite place I visited here in Australia and definitely will be doing some more Inspiration artwork painting projects coming up soon from this place. That I took pictures of like the famous white lighthouse of Byron Cape view. Not just this place but plenty more from the Sydney, Melbourne, and the great Ocean road like Lorh Ah Gorg, which was pretty awesome beach rock view. I'm Definitely revisiting Australia for sure in the near future for Broom, Perth, Uluru, Whitsundays/Whitehaven Beach, and Brisbane. "Goodeye Visual Art' Is Headed to The Land Down Under This Holiday Aussie Summer Season!" "Goodeye Visual Art' will be going down under to the Southern Hemisphere country Aussie/OZ aka Australia 🇦🇺 this holiday Aussie summer season. This will be the sixth and second installation international solo art business trip on the live painting bucket list series for the business. The trip will be taking place from Wednesday, November 28th, 2018 to Wednesday, December 19th, 2018. I will be traveling to Sydney NSW, Australia first and be staying in the city for 7 days. After that I will be traveling to Byron Bay NSW, Australia for 4 days. Also after that will be Melbourne VIC, Australia and be staying there for at least 7 days. So I will be doing five live painting Inspiration artwork projects. 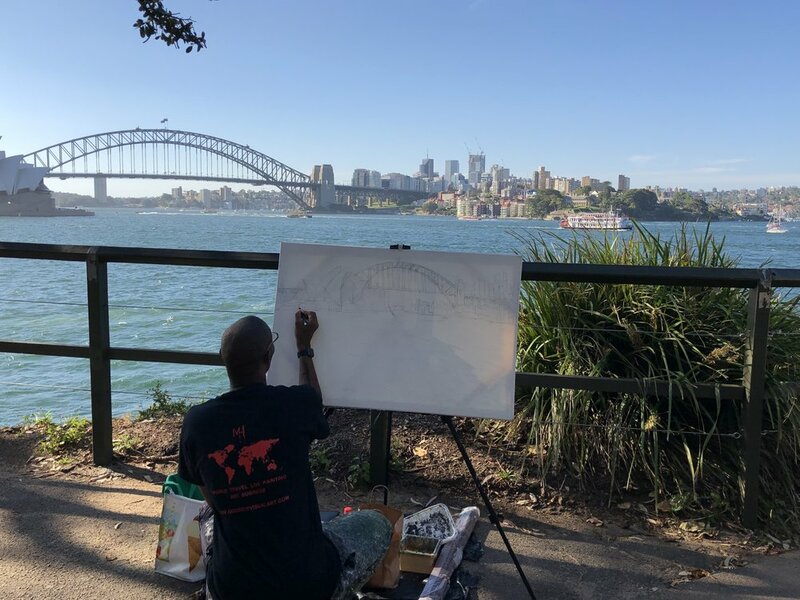 The first live painting art show will be taking place on Saturday, December 1st, 2018 at the Mrs Macquarie's Chair waterfront view park, Sydney NSW, Australia. 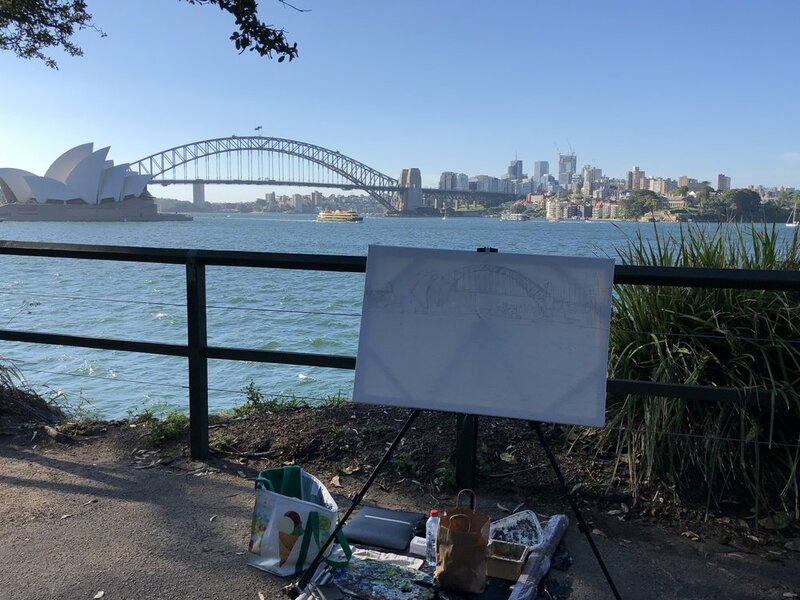 I will be live painting the Sydney Opera House/Harbour Bridge Skyline Waterfront View. This painting project will be at least three days long with a 24x36 canvas drawing painting, but it all depends it can take longer than that. The second live painting art show will be taking place on Wednesday, December 5th, 2018 at the Bondi Icebergs POOL on Bondi Beach, Sydney NSW, Australia. I will be live painting the Bondi Beach Icebergs Swimming Pool Water View. 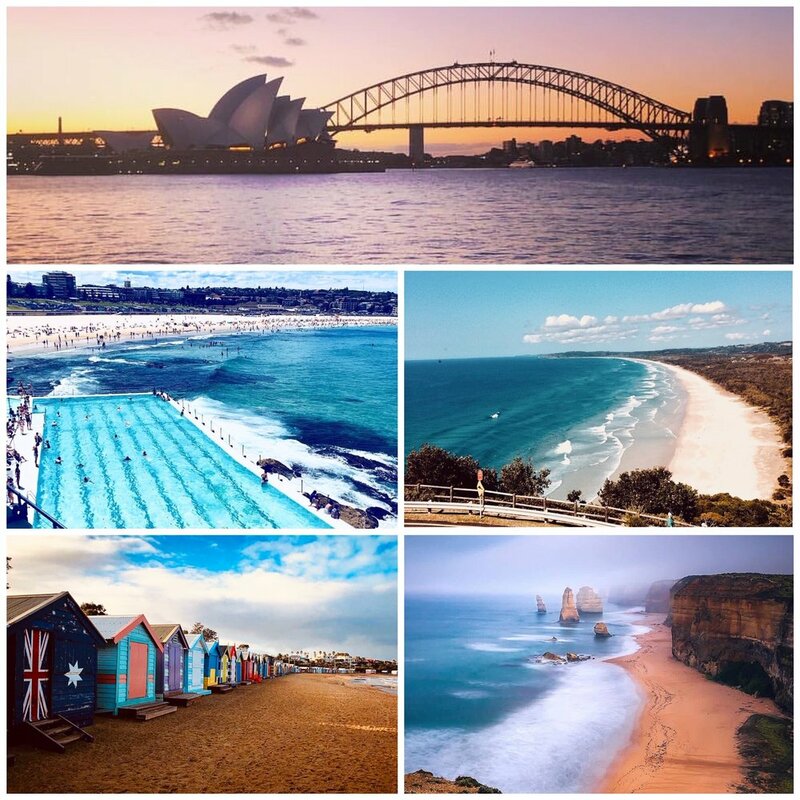 The address is: 1 Notts Ave, Bondi Beach NSW 2026, Australia. The third live painting art show will be taking place on Saturday, December 8, 2018. I will be heading up North of New South Wales State to Byron Bay and be staying there for four days. 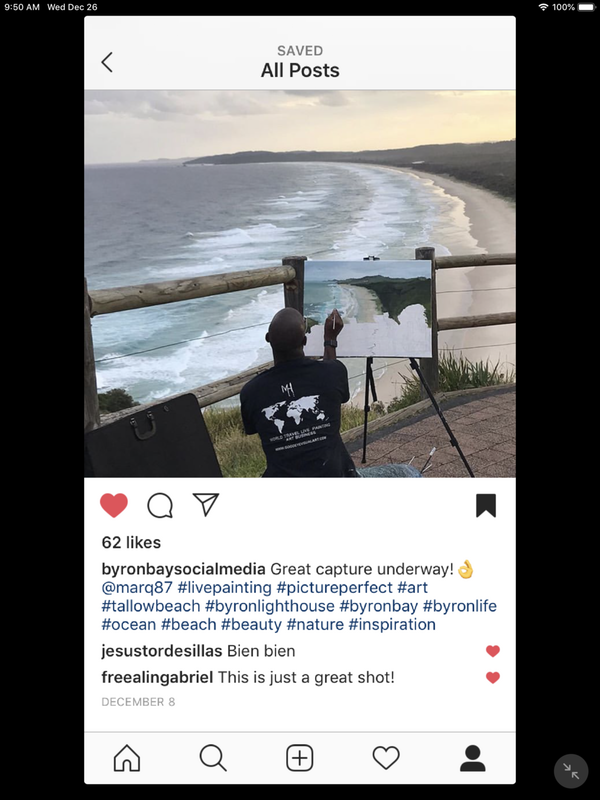 I will be live painting Byron Bay Beach Cliff View at Tallow Beach/Cape Byron State Conservation Area. The address is: Byron Bay NSW 2481, Australia. 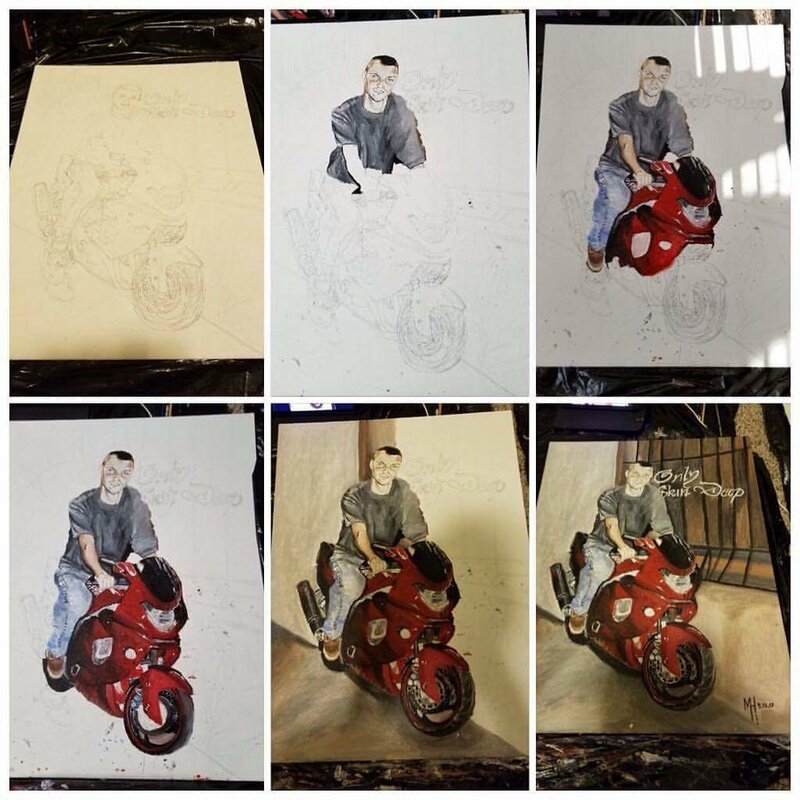 These first three art painting projects will be done in Sydney, New South Wales State of Australia and the second last two will be done in Melbourne, Victoria. 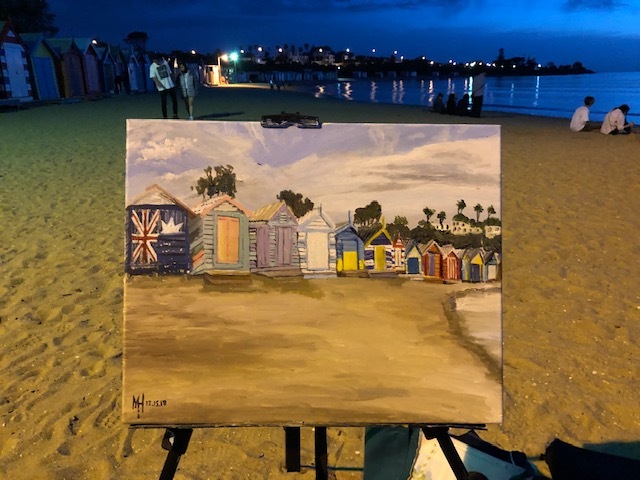 The Fourth live painting art show will be taking place on Friday, December 14th, 2018 at Brighton Beach, Melbourne VIC, Australia. I will be live painting the Brighton Beach Boxes with /waterview. From morning to sundown so as the first two in Sydney and the last one in Melbourne VIC. The address is: 131 Esplanade, Brighton VIC 3186, Australia. The Fifth and Final last live art painting show will be on Monday, December 17th, 2018 at The Great Ocean Road. 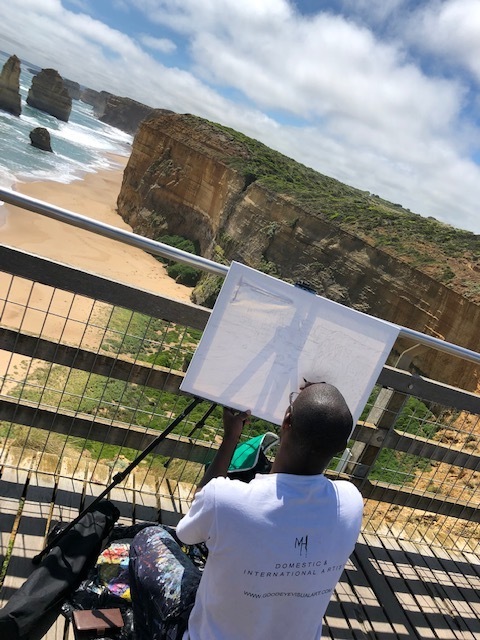 I will be live painting The Twelve Apostles Beach Waterview. The address is: Great Ocean Rd & Booringa Rd, Princetown VIC 3269, Australia. So if you're in one of these areas in Australia during this time of the year. Feel free to come stop by to see and buy some amazing beautiful artwork painting projects of Australian's best top attractions. I'm really excited about this trip and getting back on track by traveling back overseas with my artwork business. Looking forward to this trip and hoping everything goes well as plan. 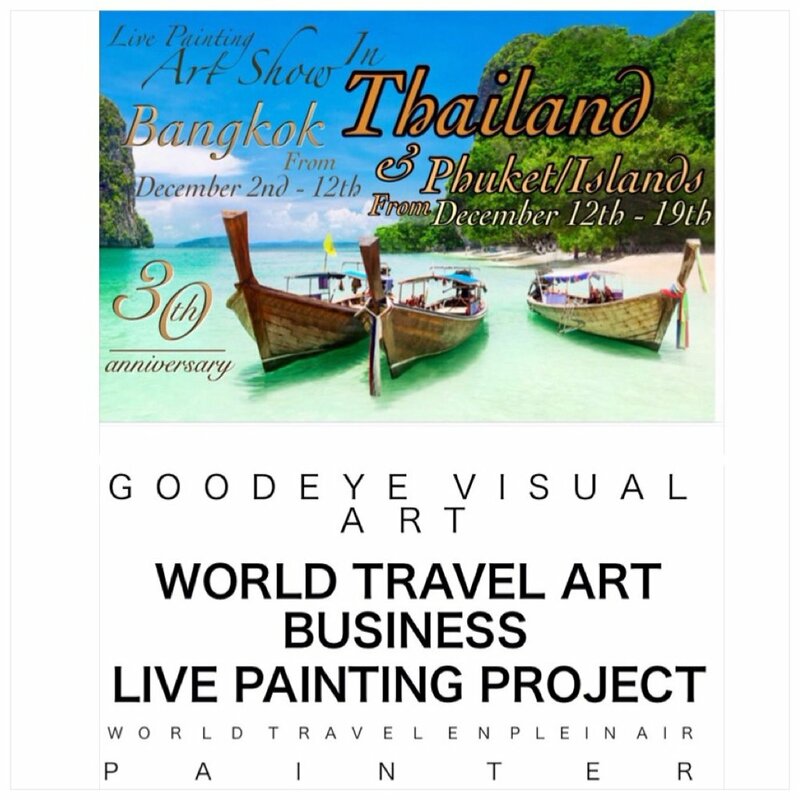 "Thailand Live Painting Art Business This Weekend!" Setting up my live painting show at the skywalk condo resort apartment/Airbnb on top of the rooftop in Bangkok, Thailand. The first solo international art business took place this past two weeks from November 30 to December 19, 2017. This was the first time ever that I market my artwork overeas that was on the bucket list and from the Asia continent. Me setting up the show at the resort. The new finish product painting of the city skyline of Bangkok, Thailand with infinity pool. Me finishing up my new product painting at my Hostel that I was staying in Bangkok, Thailand. Me setting up at the James Bond Island in Phuket, Thaliand (Province). Me sketching out the layout painting on the canvas. I met a new best friend on the Island tour and he decided to take a photo with me by my new unfinished painting I was working on. My new finish product painting of the James Bond Island I did in Phuket, Thailand. Me at my live painting show event on the beach at Maya Bay in Phi Phi Islands. Me sketching out my painting of the Maya Beach Phi Phi Island on a canvas. The finish live painting product I did of the Maya Bay Beach/Phi Phi Island in Phuket, Thailand. My Art Business card that is hangup at the Hostel Bar resort I was staying at in Chiang Mai, Thailand. From a new friend I met that is an expat from Australia that works that this bar and the hostel resort. I was so sad of living Thailand this first solo international I did taught to face my fears, stress, disappointments, and patience. What I learn from fear is that don't be afraid to try something new and experience things. which are taking the first step by getting on that international plane, getting lost and not knowing where to go, dealing with language barriers and bad communication. I learn from stress was handling a long 17 hour long flight and dealing while in the long progress. Disappointment that things doesn't always turn out and work as plan. Everyone you meet on your solo trips are not going to interested in you. You going to meet people from other different cities, countries that's going to like you and not. Patience by learning to wait on other response by people interact totally different than others and also that things are not going to get done on time you expected to be. I absolutely love this country and this trip to Thailand I already have plans going back again and this time whenever I go back to Thailand I will go to more island beaches, nature resorts, and village to do more live painting artwork. This solo art business project trips for international is only the beginning of the start in my new chapter of my life. Can't wait to experience more in my life and go to more countries to meet new people amazing people. "The Seattle, WA Art Show This Past Weekend!" Me live painting the Space Needle tower at the Space Needle Park this weekend in Seattle, WA. Setting up out of the Space Needle at the Space Needle Park. A full view of the Space Needle me at the park setting up outside in front. The finished product of the black and white Space Needle painting I did inside on the top deck of the tower. My professional photography photoshoot of the live painting Space Needle I'm doing in the picture that a photographer employee took of me while working. Me working on the live en plein air painting of the Post Alley at the pike place market Gum Wall. Me and my niece taking a phto together at my live painting show. Finially got to meet her for the first time and my other niece. Me and my older brother taking a pose with my new artwork. Me and my sister-in-law taking a photo with my new artwork. Me and my eight month year old niece taking a photo with my new artwork. 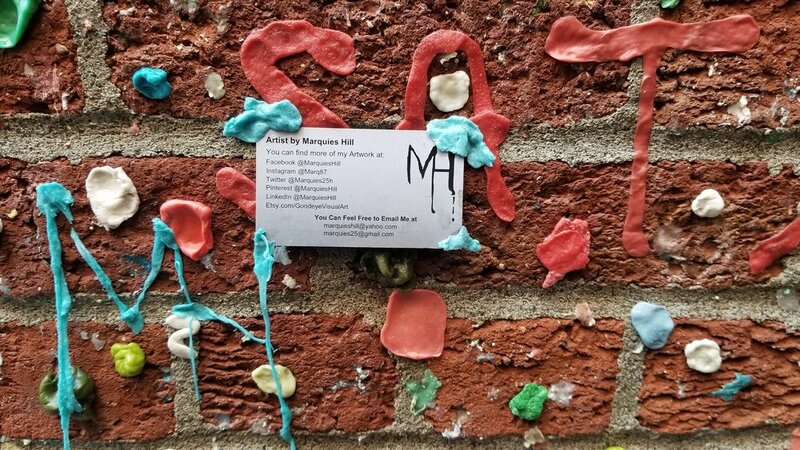 I made my art logo symbol on the Gum Wall as appreciation. left my art business card on the wall for whoever run into it and see it was an artist here painting live. I really enjoy visiting Seattle in Washington state. It had some really nice people and art design made places there. If I ever decide to go back and visit one of the place that was on my bucket list in the USA series Seattle will be on the top of the list. I only accomplished four off my list for the USA. Just eight more cities states to go and I will be completely done with the series. So I cant't wait to experience more and do more outstanding artwork. To continue to keep inspiring others across the USA country and more around the world. "Trade In a Commission work piece for a New Tattoo Design!" This past week I when and stop by in a tattoo shop and made a really good deal with the owner of the shop. We talk about adding a new tattoo on my right arm, because I am right handed. I paint and draw with my right hand. So I decided and came up with idea to put a new fresh design logo signature. For the tattoo artist to customize the new design. We both agree that if I decide to do a commission art piece for him of his son than he will do a trade to do a new design tattoo logo for me. The commission work piece is a picture of his son on a red motorcycle in the front of his father's shop store (my tattoo artist that design MH logo w/palette). That had passed away in a motorcycle accident on the same bike that he is on in the picture. The new commission art piece I had did for my tattoo artist this past week. The layout photos artwork of the making commission work..
Me (on the left) and my tattoo artist (on the right) took a selfie with both of the artworks. My new tattoo MH logo design and his commission work of his son Aaron on his motorcycle. This tattoo design took 1hr and 33 minutes to get completely done. my tattoo artist did a great job customizing the MH logo with the paint palette down the bottom. The new tattoo design logo means passionate, hardworking, persistence, dedication, commitment, and what represents myself as an great gifted paint artist. Please feel free to check my tattoo artist page on Instagram @onlyskindeep_707 and Facebook @onyskindeep name Rangoon Ricky. His shop is located in Vallejo, CA in the Oakland Bay area side. "Goodeye Visual Art is headed to the Big Apple/NYC - This Summer!" My art business "Goodeye Visual Art" will be headed this summer to New York City at the end of this month (June). This event will be the third installation in the en plein air live painting project in the #USA series travel bucket list. The art business trip will be from Wednesday, June 28th, 2017 to Saturday, July 1st, 2017. The live en plein air painting project that I will be doing will be The Brooklyn Bridge Walkway Through. This will be taking place on Brooklyn Bridge Walk (If all else doesn't fails?). Brooklyn Bridge, New York City, NY 10038. Around in the Manhattan area. On June 29th, 2017 from early morning time to close evening time starting at sundown set. IF ALL ELSE DOESN'T FAILS? Then the En Plein Air Live Painting will be also at the Brooklyn Bridge Park. Which that location address is 334 Furman St, Brooklyn, NY 11201. A public park in the New York City, New York area. 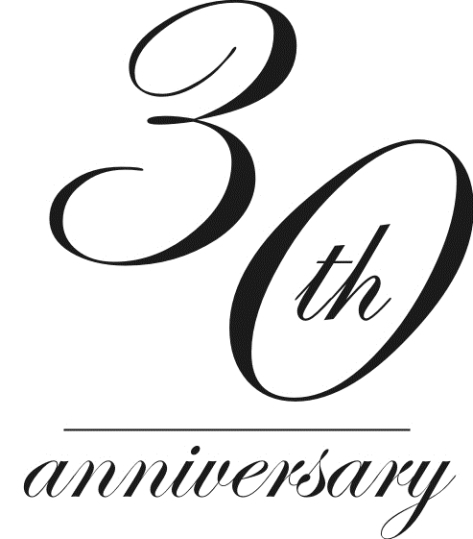 Which that will be taking place on the same day or the next on the 30th. Same time start from early morning to close evening time starting at sundown set. So if you are or will be visiting the New York City area? Feel free to come and stop by to see some amazing artwork I had did over the last few months. "The Miami Beach Art Business This Weekend!" This past weekend was the live painting art business to Miami, Florida. It was the second out of town travel business trip in the USA live painting series. The first live painting art show took place on the Miami Beach. Painting the 5th Street Lifeguard Tower at the beach area. Me and one of the employees working at the "Miami Hostel" want it this painting for donation to support the Miami Art District city. Me doing a Live Art painting of the 5th Street Lifeguard Tower on Miami Beach at Miami, FL this past weekend. Me on the South Pointe Park Pier doing a live painting of the Miami Beach skyline this past weekend. The finish Miami Beach Skyline view I did at home. The LA and the Miami trip was only the beginning. There will be more live painting travel art show events coming soon in the future. Just having my faith and confidence with God and myself. To finish what I started and my dream passion to inspired others around the world with my beautiful artwork. This year Spring Break 2017 "Goodeye visual Art"is headed to the South Beach Florida area. This will be the second installment of the live painting art show event series that is on the USA travel list. It will be a three-day business trip from Wednesday, March 15, 2017 - Friday, March 17, 2017. Along with during two live painting display shows. The first one will take place at Miami Beach in the South Beach area. Doing a live painting of the of famous lifeguard towers on the beach - "5th Street lifeguard Station Tower. Address: is on 5th Street walking towards the beach front and it will have a Miami Beach letter logo across under the lifeguard tower. The second live painting show will be around the South Beach area as well on the South Pointe Park Pier. Doing at live painting of the - "Miami South Beach Skyline". Address: 1 Washington Ave, Miami Beach, FL 33139. the pier will be open from 7:30am - 5:30pm in South Beach. If you are in the Miami Florida area or visiting around this time during the spring break week. Feel free to come and stop by to check out some beautiful artwork I had done in the last past few months. "Goodeye Visual Art' is headed to LA This Weekend!" I will be officially be having my first out of state#artshow this weekend in #SantaMonica #California this #show will be #portrait #show of other #artists around the #LA county and including mind will be feature. #Drawings and #paintings from these artists that will be participating in this event. The#art show will also feature live #music #food #drinks and live paintings from other artists that's apart of this local #gallery The information of the gallery is below; Name of Show: "A Portrait Monthly Show" at Beyond The Lines Art Gallery. Address: 2525 Michigan Ave, Santa Monica, CA Building G #8 In Bergamot Station Date: On Saturday, November 5th, 2016 (opening party event night for the monthly show) Time: From 6pm To 11pm. Speaking of the a live painting from other artists that will be in this gallery. I will be having a #livepainting show before the art event show at the hollywood sign logo #mountain This will be the first live painting, that I will be doing in my #World #Travel #ArtBusiness Live Painting#Project. Which it is on my #bucketlist travel So if you are going to be in the LA and Santa Monica county this weekend. Come check out the Beyond The Lines Gallery Show and come see my live painting show at the Hollywood sign mountain view. I'm really excited about this weekend and I hope everything will work out as it plan and no inconvenience.